Carboxylic acids comprises of a carboxyl group -COOH group (-C=O and -OH) and an alkyl group. Therefore its chemical properties are due to such two groups. The acidic properties of carboxylic acids are due to their possessing ionizable hydrogen ions (H+) that yields in the formation of carboxylate. Carboxylic acids are just partially ionized in the aqueous solution owing to the predominantly covalent nature of the molecule; they are very weak in comparison by the mineral acids. They are though 1010 to 1011 times stronger in the acidic strength than alcohols. The comparative strengths of carboxylic acids are attributable to the stability of carboxylic anion that is a resonance hybrid of two canonical forms, A and B below. The resonance energy help the ionization process, therefore the released of the proton. The two canonical forms might be conveniently represented through the single structure C. The structure, C describes the equivalence of both carbon-oxygen bonds and as well the equivalent distribution of the negative charge between the oxygen atoms. This effect of charge dispersal yields in the stabilization of the carboxylate ion that improves the dissociation of acids. The effect of charge of dispersal is more important in the benzoic acid and this improves the stabilization of the carboxylate ion. Apart from the resonance effect, the acidity of a carboxylic acid is influenced by the substituent on its hydrocarbon chain. The effect of subsituents on the acidity of carboxylic acids is based on whether the subsituents are electron-donating or electron withdrawing. Whenever an electron-donating substituent (+I effect) is linked to a carboxylic group, it intensifies the negative charge on the carboxylate ion therefore destabilizing the anion making it complex for the carboxylic acid to form the carboxyl ate and hydrogen ions. The distance between the substituent and carboxylic group as well consists of a significant effect on the acidity of carboxylic acid. As an acid, the carboxylic acids go through ionization into proton and the acid anion. The carboxylic acid can be produced by treating the salt by dilute mineral acid. The given reactions comprise the hydroxyl group. Esters are made up if carboxylic acid reacts by an alcohol in the presence of concentrated tetraoxosulphate (vi) acid as a catalyst. The reaction is slow and reversible and the yield of ester is frequently low. Esters are as well made up whenever carboxylic acids react by sulphur dichloride oxide followed through an alcohol. The yield of ester by sulphur dichloride is good. These reactions are the illustrations of substitution reaction. Sulphur dichloride oxide is specifically convenient of all the reagents as all the products are gaseous apart from acyl chloride. As well, sulphur dichloride oxide consists of a low boiling point of 79oC making it simple for the separation of the acyl chloride from surplus sulphur dichloride oxide. The acyl chloride can be hydrolyzed simply in the presence of water to regenerate the carboxylic acids. 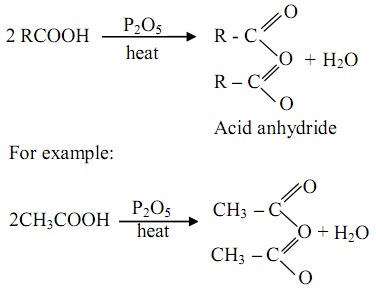 The acid anhydrides can be formed from carboxylic acid via reacting with the dehydrating agent, phosphorus pentoxide, P2O5. In the procedure a molecule of water is eliminated. The reaction is an illustration of the condensation reaction. Acid anhydrides can as well be prepared through the reaction between an acyl chloride and metal carboxylate. Carboxylic acids are not simply reduced and are immune to most of the common reducing agents. Though, Lithium tetrahydrido aluminate, LiAIH4 is a strong reducing agent capable of reducing the carboxylic acids to the corresponding alcohols. Whenever the chlorine gas is bubbled via boiling ethanoic acid in the presence of either iodine or red phosphorus in the sunlight, chloroethanoic acid is formed. The chloroethanoic acid is a colourless and corrosive crystalline solid (having melting point 61oC). The dichloro and trichloroethanoic acid are obtained through successive substitution of the alkyl hydrogen atoms. The Oxidation of methanoic acid by using acidified potassium tetraoxomanganate (vii), KMnO4 at elevated temperature provides carbon (IV) oxide, CO2 and water. This is due to the reason that it consists of the - CHO group therefore it behaves as a reducing agent similar to aldehydes, unlike other carboxylic acid. This makes methanoic acid positive to Tollen's and Fehling's tests and it decolonizes the acidified potassium tetraoxomanganate (VII). Amide can be prepared via reacting carboxylic acids with ammonia followed via dehydration of the ammonium salts formed at an elevated temperature. As well if sulphur dichloride oxide reacts by carboxylic acids followed by ammonia, amide is made. Whenever calcium salt of a fatty acid is heated strongly, it provides ketones. Though, whenever it is heated by calcium dicarboxylic acid, it makes an aldehyde.